"Thomas was one of the Twelve Apostles. Through his doubt in the Resurrection of Christ the Lord, a new proof was given of that wonderful and saving event. 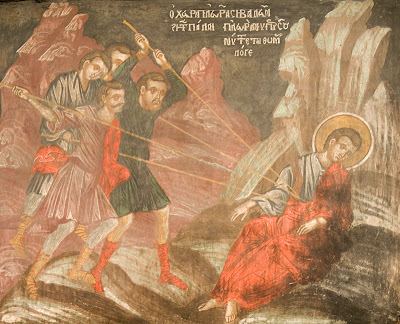 The resurrected Lord appeared to His disciples a second time, in order to convince Thomas. The Lord said to Thomas: Reach hither thy finger, and behold My hands; and reach hither thy hand, and thrust it into My side: and be not faithless, but believing. And Thomas replied: My Lord and my God (John 20:27-28). After the descent of the Holy Spirit, when the apostles cast lots to see where they would each go to preach, the lot fell to Thomas to go to India. He was a little saddened that he had to go so far away, but the Lord appeared to him and encouraged him. In India, St. Thomas converted many, both aristocrats and poor, to the Christian Faith, and established the Church there, appointing priests and bishops. Among others, Thomas converted two sisters to the Faith-Tertiana and Migdonia-both wives of Indian princes. Because of their faith, both sisters were ill-treated by their husbands, with whom they no longer wanted to live after their baptism. Eventually, they were allowed to go. Being freed of marriage, they lived God-pleasing lives until their repose. Dionysius and Pelagia were betrothed, but when they heard the apostolic preaching they did not marry, but devoted themselves to the ascetic life. Pelagia ended her life as a martyr for the Faith, and Dionysius was ordained a bishop by the apostle. Prince Mazdai, Tertiana's husband, whose son, Azan, was also baptized by Thomas, condemned the apostle to death. Mazdai sent five soldiers to kill Thomas. 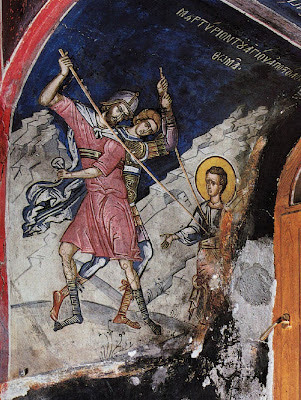 They ran him through with their five spears, and thus the Holy Apostle Thomas rendered his soul into the hands of Christ. Before his death, he and the other apostles were miraculously brought to Jerusalem for the burial of the Most-holy Theotokos. Arriving too late, he wept bitterly, and the tomb of the Holy Most-pure One was opened at his request. The Theotokos' body was not found in the tomb: the Lord had taken His Mother to His heavenly habitation. Thus, in his tardiness St. Thomas revealed to us the wondrous glorification of the Mother of God, just as he had once confirmed faith in the Resurrection of the Lord by his unbelief." "We have a building of God, an house not made with hands, eternal in the heavens (II Corinthians 5:1), says the discerning Apostle Paul. All our efforts for God on earth have this purpose: to merit, according to our power, this eternal house in the heavens not made by hands. The Indian King Gundafor decided to build himself a magnificent palace, unlike any other on earth. When Abban, his envoy, sought a skilled craftsman to build the king's palace, he met the Apostle Thomas by God's providence. St. Thomas told him that he was a craftsman, and that no one else could build what the king wanted. Thomas therefore received much gold from the king for the building of this palace. As soon as he departed from the king, he distributed all the gold to the poor. The palace site was some distance from the king's capital, and after two years the king sent servants to ask Thomas if the palace was completed. Thomas replied: ``Everything is ready except the roof,'' and he sought more money from the king; and the king gave it to him. Again, Thomas distributed it all to the poor, and went throughout the kingdom doing his work, preaching the Gospel. The king, learning that Thomas had not even begun to build the palace, seized him and threw him into prison. That night, the king's brother died, and the king fell into great sorrow. An angel took the soul of the deceased and, leading him through Paradise, showed him a magnificent palace, such as the mind of man could not imagine. The soul of the deceased wished to enter that palace, but the angel told him that he could not, for it was his brother's palace, which the Apostle Thomas had built with his alms. Then the angel returned the brother's soul to his body. When he came to himself, he said to the king: ``Swear to me that you will give me anything I ask.'' And the king swore. Then the brother said: ``Give me the palace that you have in the heavens.'' The king was amazed that he had a palace in the heavens. When the brother described everything in detail, the king believed and immediately released Thomas from prison. Then, when he heard the apostle's preaching of salvation and eternal life, the king and his brother were baptized. King Gundafor undertook new works of charity, and built an even more magnificent palace in the heavens for himself." can I flee from the righteous? [has come] to Edessa before me. Here is he and also there. I went there, there he is. Here and there I found him, and I am gloomy. Did that merchant carry the bones? Or perhaps, indeed, they carried him!" St. Ephraim also refers to the transfer of St. Thomas' relics to Edessa in the 4th Century, from where they were later transfered to Constantinople, and then the west. 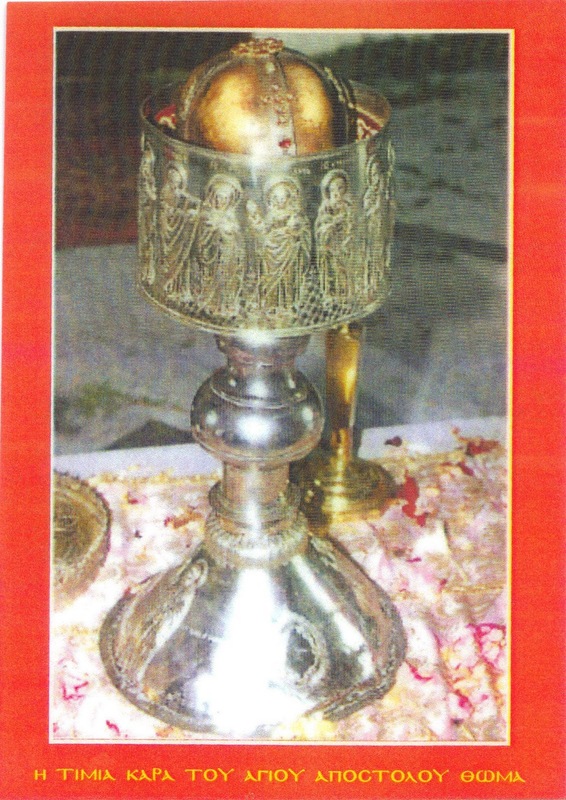 On a related note, the Holy Monastery of St. John the Theologian on Patmos (Greece), near the site of the Revelation to St. John and built by St. Christodoulos, has the blessing of protecting the Holy Skull of St. Thomas, which continues to work many miracles. 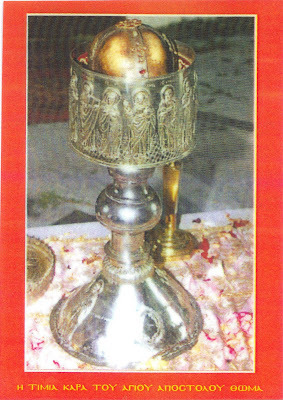 For more information on the Feast of Antipascha, or St. Thomas touching Christ's Side after the Resurrection, see: http://full-of-grace-and-truth.blogspot.com/2009/04/sunday-after-pascha-st-thomas-sunday.html. In closing, I include the Oikos for today's feast, translated by Fr. 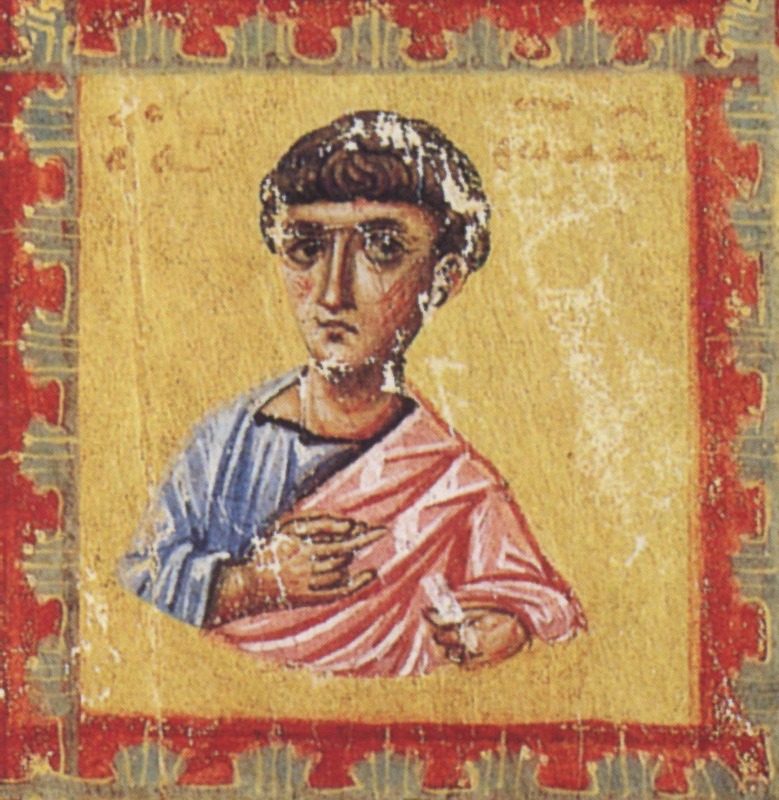 Ephraim (http://www.anastasis.org.uk/6october.htm). May St. Thomas intercede for all of us! Amen! "When Peter said to the inspired Thomas, Christ’s Disciple and great speaker of mysteries, ‘We have seen the Lord’, he said, 'If I do not see in his hands the mark of the nails, and handle his side, I will not believe’. But the Creator and Master of all things came as a slave, wishing to save all, and said to Thomas, ‘Handle the marks in my hands and side, and do not be unbelieving; for I am the Lord your God’. But he cried in repentance, ‘You are my God and Lord’." 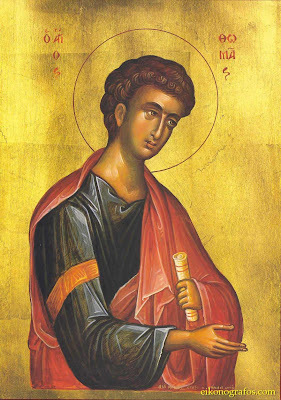 O Holy Apostle Thomas, intercede with the merciful God that He grant unto our souls forgiveness of offences. 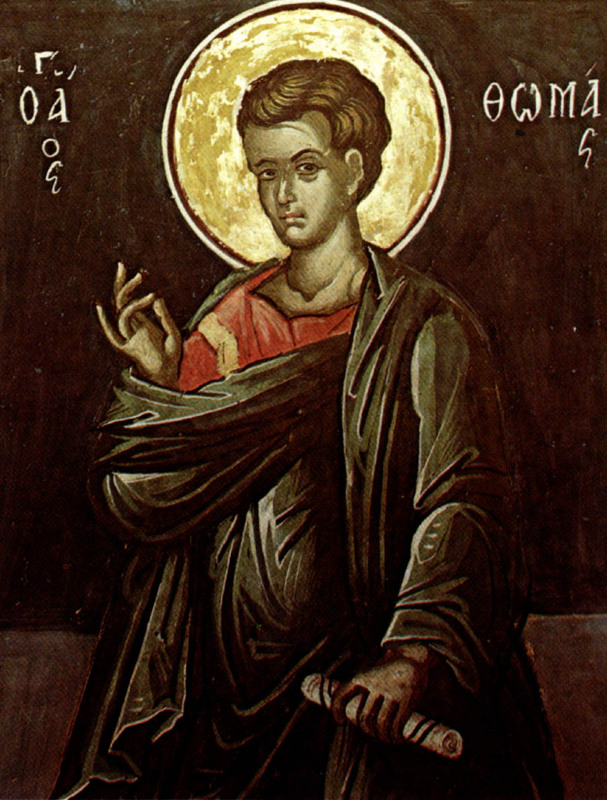 Christ's Apostle, who was filled with God's divine grace, he who was His genuine and faithful servant in all truth, all-lauded Thomas exclaimed aloud in deep repentance: Thou art both my God and Lord. Wow. This was so inspirational. I thought i knew St. Thomas, but wow. I have never heard that story about the king's palace before. I'm really glad that someone made this website.